If you haven’t spent a lot of time in the city, you might not think that a lot of cars would turn up for a car show in NYC. You certainly wouldn’t expect a multi-million dollar 1956 Maserati race car to roll out on a quiet Sunday morning in the middle of Brooklyn. 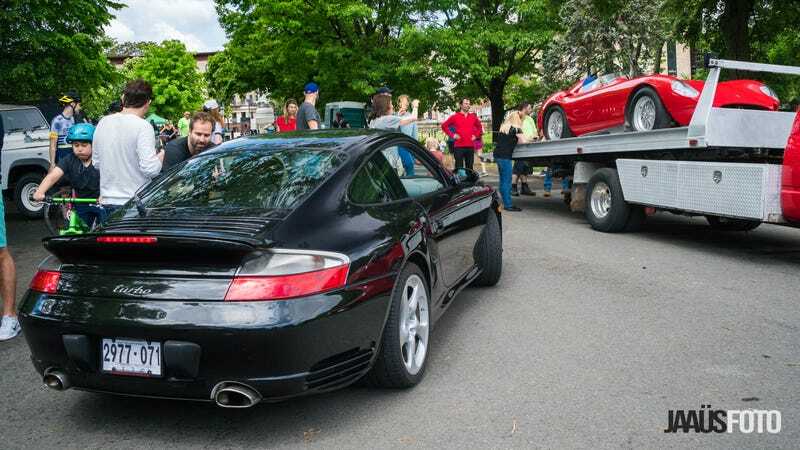 The CarPark Cars & Coffee was held this weekend in, of all places, Prospect Park, and it proved that place can be a solid venue for some very good cars. This is a Maserati 300S, one of 26 examples, rocking a 3.0-liter version of the straight six that nabbed two Formula One driver’s championships in 1954 and 1958. Aw man, cute dog. Oh wait, right the 300S. I saw T-Minus claim it’s worth $8 million and that seems like a reasonable estimate for one of the high points of 1950s sports racing cars. Amazingly, it wasn’t the rarest thing at the show. That looks like it was this Porsche 968 drop top, supposedly a one-of-one car. I assume that’s just a feature of the color combo being too ’90s for anyone else to handle, but that’s just a guess. I love the 968. It was part of Porsche’s most desperate years, when the company was genuinely scrambling to stay afloat after having been so successful in the yuppie 1980s. This was the biggest and baddest of the four-cylinder front-engine Porsches, with a 3.0-liter straight four, the most powerful version of which (the ultra-rare Turbo RS) made a wild 350 horsepower. What I wouldn’t give to see Porsche give this recipe another shot. Porsche can get 250 horsepower out of the 2.0 liter in the base Macan. It could do huge numbers with another liter and modern tech if it wanted to. But that would make no sense, and Porsche isn’t desperate like it used to be, so it won’t. Sigh. The tags for the cars in the show were cute, looking like fake parking tickets, and the general vibe was very New York-ey, in that it had not only super fans but also lots of random people walking through the thing oblivious and just trying to get somewhere else. This was very much not a typical car show, but I wouldn’t have wanted it to be. It got the New York City vibe one way or another. I adore this black over blood red late Porsche 356, for instance. And this very well-roped old Land Rover. And this spectacular E34 BMW 5er. I’m always hesitant to call any 1990s BMW a real M5. I believe this is a real M5. I apologize to the owner if it is a real M5 and I doubted for a moment that it’s real. Don’t blame me, blame every fake E36 M3 out there. All in all, it’s nice that the show brought cool cars to the people of Brooklyn, otherwise idly chatting about low ABV craft beers and whatever else is your usual conversation in Park Slope. Here’s hoping for more of this to come. That's A Real New York City Car!